Everybody loves their furry companions, and most of us see our pets not just as animals, but as cherished members of our families. Naturally, when separation and divorce are on the table, arguments and disagreements about who gets to keep Fido are bound to crop up. 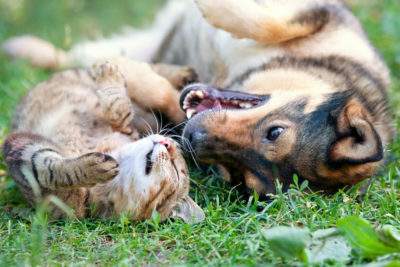 For this post, we want to offer a brief explanation of the options that are available for couples who might be feuding over a pet in the household. Though every situation is unique, there are general guidelines that apply in all cases, and this information should offer a good starting place as you explore your options. For a more guided discussion, we invite you to reach out to us at R & S Law Group, LLP. The primary thing to keep in mind is that, in California, pets are considered property. So while pets are valued as beloved members of the family by pretty much everyone, as far as family law is concerned, your pet is no different than the living room couch. This can make things tricky. For one, property is usually divided after a divorce or separation, not shared. This means that a “joint custody” arrangement might be difficult, but not impossible, to organize. Separating couples have the discretion of sorting their own arrangements beforehand, and working out an arrangement that both parties agree to is often more productive than continuing to argue over who gets to keep what. Not only that, but a new 2018 law gives feuding pet owners even more options to pursue a resolution via the courts. This new law serves as a compromise of sorts, and allows judges to weigh in on pet custody issues if the situation warrants it. As per the new guidelines, judges can look at factors such as who generally feeds and takes care of the pet, who is in charge of taking them to vet visits, and more. This option could prove effective for those who simply can’t come to an agreement, and need a professional mediator to help establish an arrangement. Whether you opt for this option, or prefer to settle things with your ex on your own, we highly recommend that you take the time to consult with a qualified family law attorney! To learn more, remember that we at R & S Law Group, LLP are always happy to help. Call us today to schedule a free initial consultation, no commitment required.